In this section we discuss how to formalize the collaborative structure. 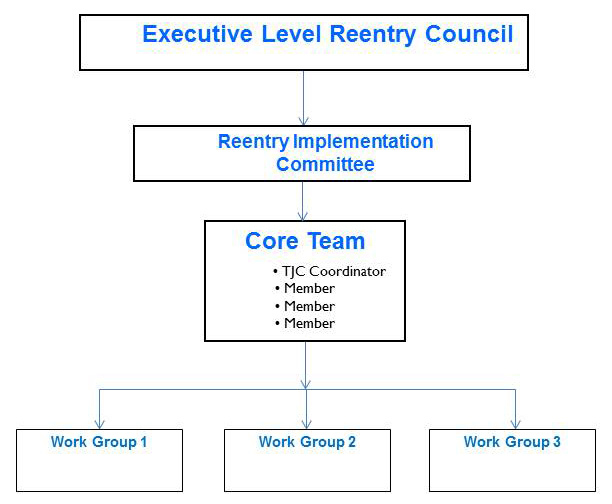 We doubt that any two locations will have identical collaborative structures, but often it is a pyramid-style structure comprising an executive-level reentry council or criminal justice coordinating council; a reentry implementation committee that includes a core-team group of members and subcommittees or work groups composed of system stakeholders. Each group or agency will have its own unique role to play in the collaborative structure, and agencies may use documentation such as memoranda of understanding to formalize the collaborative process in writing. Click here for a TJC Leadership Profile on Jane Klekamp, Manager of La Crosse County Chemical Health and Justice Sanctions in La Crosse County, WI.